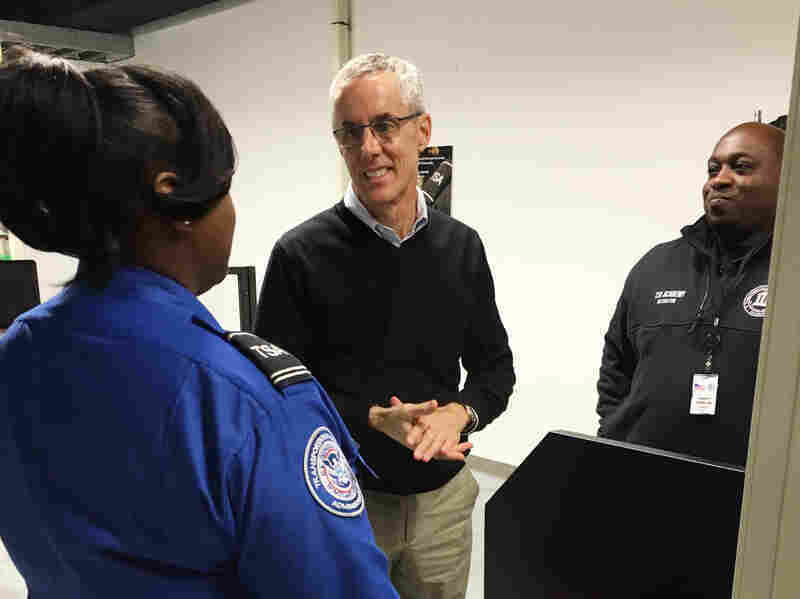 Body Scanners And Explosives: TSA Starts Academy For Screeners : The Two-Way After reports last year showed that auditors had easily smuggled fake explosives through security checkpoints, TSA has stepped up training for new hires. An instructor conducts a training session at Transportation Security Administration Academy at the Federal Law Enforcement Training Center, located at a sprawling former air base in Glynco, Ga.
On a chilly afternoon in south Georgia, more than 100 Transportation Security Administration trainees are huddled together on metal bleachers overlooking a field. They're watching an explosives instructor demonstrate what can happen if they don't do their job well. "All right, confined smokeless powder in three, two, one." The trainees (and an observing reporter) jump, startled by the explosion 100 yards or so before them. More blasts follow, with different explosives. The lesson for these new hires? That the consequences of a mistake are deadly. This is the TSA Academy, established just last month. It's part of the Federal Law Enforcement Training Center, located at a sprawling former air base in Glynco, Ga. Some 96 federal agencies train here. Much of the TSA training takes place in classrooms, where newly hired transportation security officers, or TSOs, spend two weeks learning how to identify different things the bad guys might try to sneak onto planes, such as dangerous explosive igniters that look like everyday objects, say an eyeliner pen or a tube of toothpaste. TSA Administrator Peter Neffenger (center) speaks with two academy instructors. There is also a full-scale mock-up of a typical airport screening station, with body scanners, metal detectors and X-ray machines, where the trainees are taught and sometimes struggle with how to interpret the images of objects inside the bags that pass through. It illustrates the difficulty the TSOs have in the real world. That was made all too clear last June, when reports revealed that government auditors had smuggled simulated explosives and weapons past TSA checkpoints 67 out of 70 times. Peter Neffenger became TSA administrator shortly after that, following a long career in the U.S. Coast Guard. He paints that failure as a wake-up call for the TSA. "I think it was transformational for us," Neffenger says. "It allowed us truly to look at the systemic issues in the organization that might lead to those kind of failures at the checkpoint." Issues such as officers worrying more about keeping the line moving at checkpoints rather than giving passengers and bags thorough inspections. The TSA Academy is aimed at driving those points home and instilling a sense of professionalism among TSA officers. Neffenger is enthusiastic about the opportunity the academy presents. "They do real-world, scenario-based training here, spend time in the classroom [and] come out to the lab. It's very exciting for me to connect them to people who are doing the mission all across the country in a way we've never had a chance to before." 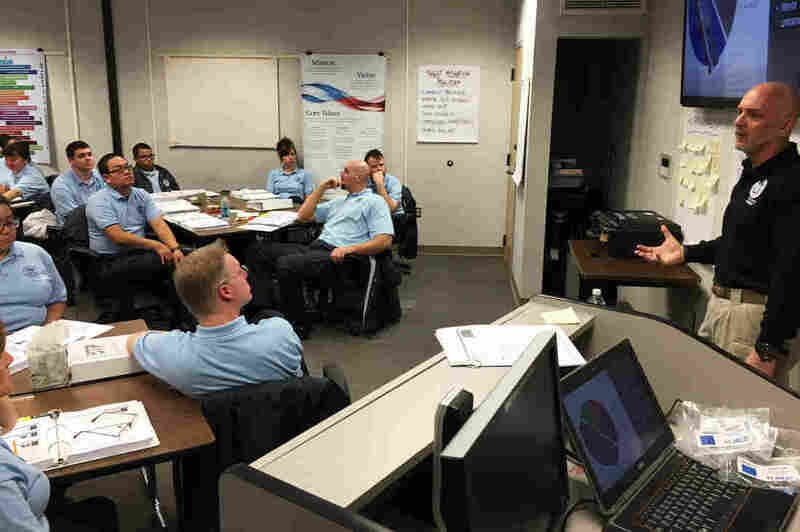 One of the TSA Academy instructors, Shawn Weeks Freeman, says today's training is a lot different from when she joined the agency in 2004, not long after its founding. "When I joined it was a laptop in a hotel room ... and then very much on the job training. Thats kinda how I learned." Weeks Freeman brings a very personal, firsthand experience to the classroom. In 1982, she was a flight attendant for Pan Am when a bomb, placed under a passenger seat, went off in her plane en route from Japan to Honolulu, killing a Japanese teenager. That experience brought her to TSA in the first place and guides her work today. "I always bring that home to my students," she says, "because I say if it takes one-sixteenth of a second more, just give it a little more pressure, give it one more look, check it, ask for somebody, just one-sixteenth of a second it could save [a] life." And that is the key lesson the TSA hopes its officers will learn at this academy, that the stakes are very high.